I feel like I’m in grad school… I have been searching the web for ideas to spruce up the TV room. What I’m thinking about doing is starting small with pillows on the sofas. Here is what I have found that is really standing out to me. As you can see, I’m trying for blues. I just love buffalo checks. However, now that I really look at them together, I’m rethinking! The second part of the sprucing up will be for the TV armorie. I have found some things that could be interesting arranged on top. I thought something like these for some height on the TV armoire. Something like this for balance. I really love the bird cage!!! I love this part- the beginning stages. It is always fun to see the canvas blank and watch it come alive with color and objects that have meaning in your life. That is the thing for me. Everything that would be an accent piece in our home has meaning. We picked it up somewhere or it was given to us as a gift. I like for our house and the items in it to tell a story. That is a priority! I know what I’m thinking. I know what I want. Now the fun part… the hunt! On Friday, the week is done and you come home and just want to relax. You want a meal that will not be fussy. You want it to be filling, easy, and tasty! Hubby and I are not health nuts- yet. We are getting that way. We have cut out basically all of our processed food. YEA!!! Cannot tell you what that has done to our energy levels and our waistlines! We love pizza! However, it has to be fresh and homemade. I usually make our own pizza crust and double the recipe and freeze it. But this time, we ran out and had to make do! It all worked out! Start off with fresh basil. Do the same with parsley. Pick leaves off and put in food processor. And pine nuts with olive oil. Push that magic button and watch it do its thing! Always have a couple of these around in case I run out of the homemade pizza crust! It is an okay substitute! I have not yet found a really good homemade pizza sauce recipe. So I use this. Spread. The amount is up to you! Toss on some sun dried tomatoes. Top with ricola leaves. Bake in oven for about 20 minutes. Combine all ingredients and blend in the food processor. Set aside. 1. Coat crust with olive oil. 4. Toss on sun dried tomatoes, feta, and ricola leaves. 5. Cook in oven for about 20 minutes. Enjoy!!!! It is a great way to get the weekend started! If there is one room in our house that is my least favorite it would be the TV room. It is a good thing that we do not spend a lot of time in there! If we did, I think I would have come to this conclusion sooner. I sometimes feel it is room of brown hues with accents of blue. I have wood floors (honey brown). I have brown walls (think iced chai). I have brown suede sofas (caramel). I have a wood coffee table (honey brown). 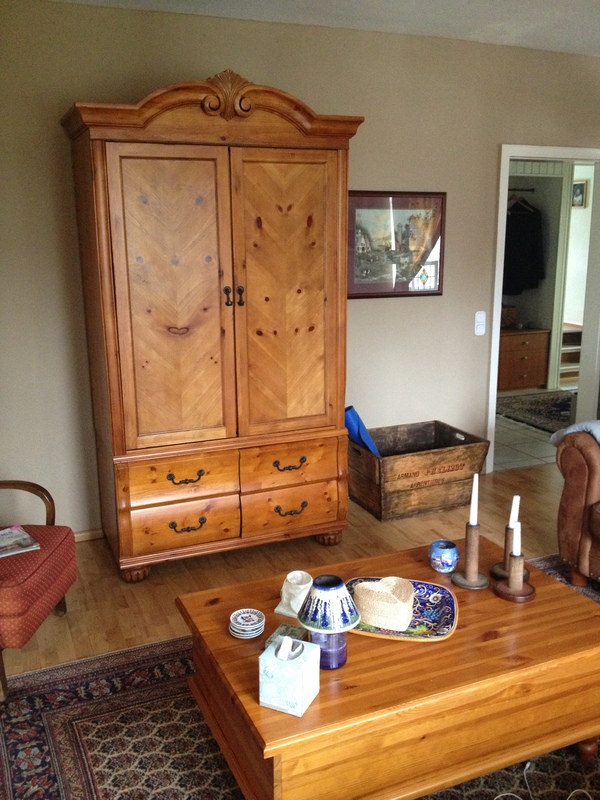 I have a wood TV armoire (honey brown). Getting the picture…. BROWN. I like my accents though. I love the navy blue carpet that centers the room. I love the Italian plate that anchors the coffee table. I have beautiful hand painted and glass balls on the end table. Those are happy. Here is a better look at the TV armoire, coffee table, and carpet. All furniture in here is great. Just a lot of brown! This a ‘good’ spot in the room. I love this little corner. 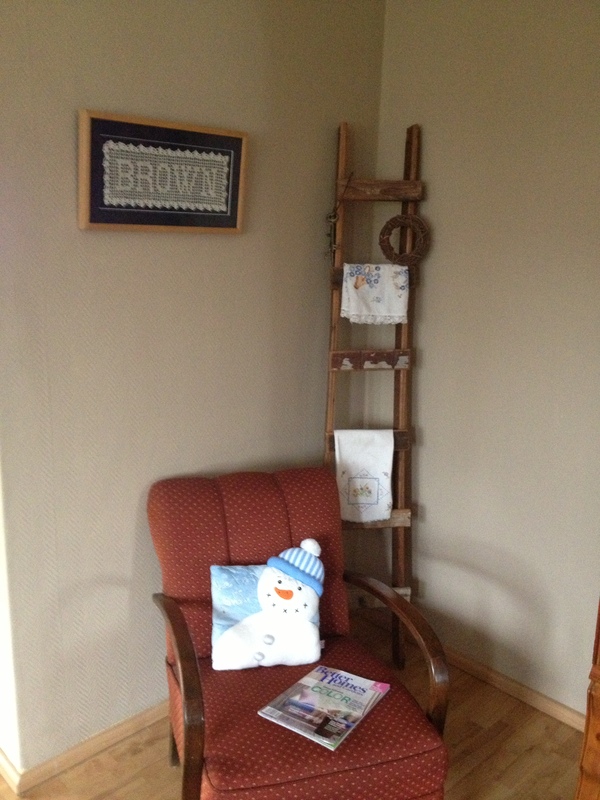 The chair and the ladder were found on one of my ‘junking’ trips around a village we use to live on. ‘Junking’ is where the Germans get rid of their unwanted things. They sit them out on the curb. The items are free for the taking until the city comes and picks it up. I have found a lot of great stuff through the years! And a lot of junk! These are two treasures! So my creative decorative juices are starting to turn. I am going to start small. Pillows! 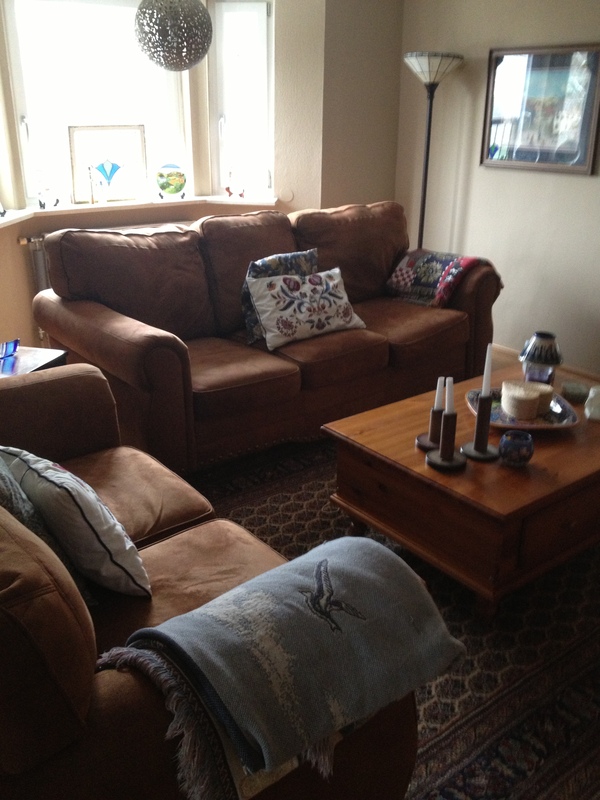 I will begin the search for bold pillows in shades of blue for the two sofas and the chair. From there, I will see where that leads me. I am a patient person. I will look until I find exactly what I like. I love the combo of tan and navy. I have tan/brown already. I just want to play with the navy part! I am also thinking about the top of the TV armoire. Some items that bring in color but does not look cluttered. I do not do clutter. Of course, I will be hitting the web for inspiration. Should be fun!!! I love projects! I will keep you updated. This weekend I spent strolling the streets of Berlin, Paris, and New York and I did not even leave my sofa. You know when you have found a great book when everything is piling up -laundry, dishes, housework- and you are engrossed in pages of words and not really caring about those piles. That happens to me a lot. I always say I will read for only one hour. I even set my alarm. Then the alarm goes off and I’m wanting to know more and more. So I set it again, 30 minutes. I should just accept the fact that when I’m ready a really good book I’m down for the count! I started this book Saturday afternoon. I could not put it down. That fact that I have been to basically all of the places that the author talks about made this book real to me. Ms. Weiss was born in West Berlin in the mid 1970s. Her father is American and mom is Italian. She describes what it was like growing up in Berlin and when her parents divorce about growing up shuttling back and forth from Boston to Germany. Each chapter is intertwined with her love of food and cooking. Why does this resonate so much to me? Of course, I live in Europe. I realize a lot of people do not understand that I really consider this my home. This is where I became an adult. Our daughter was basically raised here. When I’m visiting the states, even though I’m excited to be there, I long for the relaxed slower pace of Europe. I love that in the spring I can stop on the side of the road and cut my own flowers and that I can be trusted to pay. I love walking the downtown streets and venturing into shops- not malls. I love traveling by subways and trains. I am able to view the country side. I love watching the ladies hop on their bicycles to go into town every single morning during the summer for the day’s food supplies. They are always dressed nicely with their hair done. I want to be like that when I grow up. I love that fact that Hubby and I can go for a walk and hear nothing at all except for our voices. For me, Christmas is about gluwein, Christmas markets, and advent candles. Easter is about braided bread and hand painted eggs. Walking along cobblestone streets looking at century old buildings is how I want to spend a Saturday afternoon. I totally understood this author as she followed her heart and gut and moved from New York back to her home of Berlin. I did a lot of “Amen sister!” as I was reading. Her home is mine. I am torn also because I’m a very proud American. I miss things about the states- Whole Foods, HEB Central Market, football. However, I have come to realize this is my true north. This is where I belong. The book is fabulous! The recipes are interesting. I will be trying out a few before long. But now, it is time to really look at those piles…. It is another cold, grayish weekend in our neck of the woods. A little snow. A little wind. It is winter. My second favorite place to be is a library. First is home of course! Rows of books. Rows of adventures, knowledge, and life. Rows of opportunities. Knowing we had a ‘down’ weekend ahead, this week I stopped by to browse. I can never just walk into a library and come out with nothing. It is not in my genes. I was in a biography mood for some reason. Maybe it was because last weekend I final saw Lincoln. Who knows. I go through reading phases. One summer I read biographies on every single first lady except for Polk. Still looking for a good one for her. Another summer I fancied myself Russian. I cleared the library shelves of Russian authors. Then I was looking for books set in Italy. See, phases! I found treasures!!! From Mary Todd Lincoln (different one than the one I read a couple of summers ago), Wallis Simpson, Valerie Plame, to a book called My Berlin Kitchen, I have reading material for a week! I also could not resist Julia. Who can resist her??? Now the question is which one do I start with first? I am woman, hear me discuss shoes! I LOVE shoes. REALLY LOVE shoes. Flats, sandals, heels, boots, and running shoes. I will literally stop in my tracks at the sight of heeled beauty. I will pet and stroke leather. I just get so excited!!! I do not wear shoes that will hurt my feet. I have to be comfortable. I am on my feet a lot at work and on the trails. I will admit, I love wearing heels. I think they are classy and elegant with dresses, skirts, pants, and/or jeans. Who can resist a classic pair of pumps with detail stitching? I…..cannot. My lust for shoes does not stop with ‘regular’ shoes. It continues with running shoes! Look at these…. Gorgeous, darlings! They are even better on! A shimmering blue just says watch out. They are not loud. They are not nondescript either. To quote Goldilocks, “They are just right.” Amen! The light in our bedroom gives the stripes a peachy color. I wish Addias would a have thought of that! The feet are really appreciative I have to tell ya! They are nice and comfy for a long run! YEA!!!! Since my special occasion (here we come Paris!) this time around required some traction, these fit the bill. I go through running shoes every 6 to 7 months. Next shoe shopping time, I think I will go more for the dressy kind. Maybe some slingbacks, or 40s style…. So little time, so many shoes…. A week from today we will be heading to Paris to run their half-marathon. We are SOOOO ready!!! Bring it! One of the requirements to enter is for us to have a physical. So we trotted over to our doctor and did the usual stuff. She was a little baffled as to why we needed it. However, I made a joke about that it kind of made sense because they do not want us to sue them in case we fall over or something. She said that made sense. See why I like her??? She thinks I’m funny. Hubby and Amazing Daughter do not. Anyhoo, after the required blood work she decided that we needed an EKG. I was like….why??? Of course they had to tell me this as they were checking my blood pressure. I just turned to the nurse and smiled…. I guess it was okay! I have watched doctor shows. Loved ER. So as I was waiting, I was trying to remember what it was and what they were going to do. I knew it had to do with the old ticker. So I walk in there a little anxious. Told to lay down. Great! Liking this already! Maybe this was not going to be so bad after all. Then the nurse starting hooking me up. Ankles, arms… I felt like I wanted to see if I could communicate with people outside of…well here. Next came these things that were not pads like on ER. They looked likes mini suction cups- 6 of them…. Then she pulled out the bottle. I busted out laughing. The bottle is that lotion they use on the pads. It is the stuff they use for sonograms. I was laughing because I knew it was going to be cold. She looked at me puzzled. I explained. She told me no it was not going to be cold because she ‘heated’ it up. I thought right. She assured me. I told her the last time I had this stuff on me I was getting my last sonogram before I delivered. I told her they informed me that I was having a boy. She was being nice and asked how he was doing. I started laughing again. I said he turned out to be a she and she was doing AMAZING! I was suppose to be relaxed. I was laying down after all. However, I could not. I was thinking, always dangerous, how is the heart? I have never been concerned about it. I take pretty good care of myself. The nurse kept telling me to relax. I knew she could tell that I was ‘thinking’. I wanted to tell her I cannot relax since I’m trying to contact life outside. Before I knew it, it was over. She looked at the paper shaking her head. All she said was ok and that the doctor would be in. Great. The doctor deemed the ticker good enough to race. Everything is good to go. Nice to know! YEA!!!! Love plates! Mostly plates that we can eat off of. 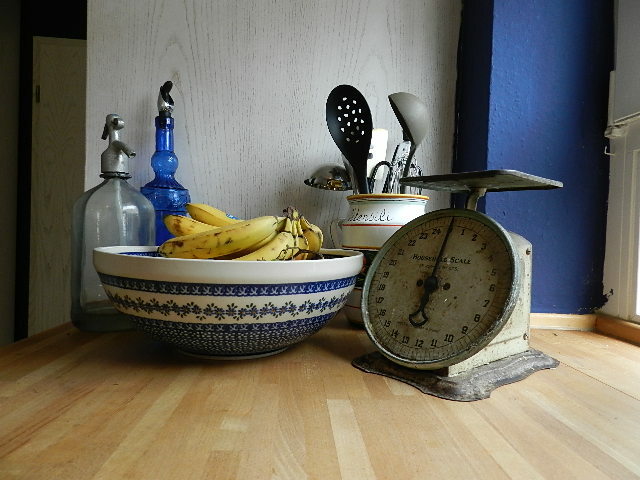 But over the years, I have found just pretty plates for display. Most have found their way into our home by way of flea markets. I’m cheap! However, I do not mind paying a little bit more for something, let’s say prettier! Take this two pieces of art. Both were purchased at flea markets for under 50 cents. The top one I actually bought all they had- 3. The flowers in the center are faded. To me, that make it even better. The bottom one is loud, bold, and gorgeous! Common themes- flowers and blues. Again, common themes are displayed. Both of these plates were 25 cents each at a flea market. The top one is a little different. It has this remarkable bird front and center. It called my name. It is fancier than I usually go for. Combining it with the simple blue floral one fits somehow. It is like wearing pearls with a twin set of sweaters. Elegant and classic. My plates are not just in the kitchen. I have them throughout the house. We have a bay window in our tv room. In the windows, I have my treasured Villeroy and Boch four season plates. I found two of them at flea markets and had to buy the other two!!! As I said, I do not mind paying some ‘real money’ for beautiful pieces. This masterpiece sits on our coffee table in the tv room. I bought it in Florence. Yes, we can all sigh…. dazzling! On our travels or strolling the local flea markets, I am always on the hunt! Who knows what might show up next! It is that time of year when I start looking for new ways to cook a favorite veggie. I start looking at old recipes that I have not used in a while or go internet hunting. A couple of years ago I went over to assist my parents when my mom had knee surgery. She had stacks of Cooking Light magazines around the house. I started reading. Then I started copying. I really wanted to just tear out the pages but I did not think that would be fair. See I am a nice daughter! Horrible nurse, but nice daughter! This particular recipe caught my attention because it had two of hubby’s favorite foods in one! Now I do not know why, but I had not used this recipe. I guess I was saving it until now! After cooking and eating this, I should be slapping myself silly for not cooking this before. It was a hit!!! Line sheet with sprayed foil. Roast squash for about 45 minutes. While bacon is cooking dice shallots. Using some of the drippings from the bacon, saute the shallots for about 8 minutes. Combine roasted squash, bacon with the shallots and set aside. While pasta is cooking, grate parmesan and provolone cheese. Slowly add milk over medium heat until thickened. Add provolone cheese- keep stirring. Make sure that the pasta is coated well. In the sprayed casserole dish, pour pasta mixture on the bottom. Next add the squash mixture. Sprinkle with parmesan cheese. Put in oven until the cheese is browned. The recipe said to serve with rustic bread. This was perfect! Freshly removed from the oven! We had this robust Spanish wine. Fabulous!!! 2. Combine salt, rosemary, and pepper. Place squash on foil-lined backing sheet coated with cooking spray; sprinkle with salt mixture. Cook for about 45 minutes- until tender. 3. Cook bacon. Remove and crumble. Reserve about 1 1/2 tsp of drippings from pan. Add shallots to pan. Saute for about 8 minutes. Combine squash, bacon, and shallots and set aside. 4. Cook pasta according to instructions. 5. Combine flour and milk (add gradually) in pot over medium heat. Stir using a whisk. Remove from heat and add provolone cheese. Keep stirring until cheese is melted. Add pasta to cheese mixture. Coat well. 6. In sprayed casserole dish, pour pasta mixture on the bottom. Add squash mixture and top with parmesan cheese. Bake at 450 for about 10 minutes or until cheese is brown. According to dictionary.com organization is a method, structure, or system of order. That is me in a nutshell! I thrive on organization. My world is out of whack when order is temporarily out-of-place. I’m a Type A personality. Hubby calls is something else. Good thing he loves me! I get excited when I walk into The Container Store. Good thing they do not have them over here in Europe. Not only can you find the tools to bring order to your environment, you can do so with color and style. Thank you The Container Store! Just to get my fix, I will go on their website and surf, dream, drool…. Everything has its place. This is an entire wall of floor to ceiling shelving heaven. I opened them up the first time we came to see the house and thought I was about to pass out. Was I hallucinating? I pinched myself and smiled! In my mind I began deciding the order for each shelf. Finally, a place that thinks like I do! A shelf devoted to placemats, napkins, and napkin rings. Yes, they are in color order. Man, I have a lot of tablecloths! The method of organization is white/ivory on one side and colored on the other. These are more tablecloths and runners. I have the divided into square, round, and long rectangle. Table setting at my fingertips. I can see what I need and BAM, I am moving on! Love it! I did not stop there. I needed order when it came to bed linens. Duvet covers, also sacked by size. There is just something about opened up the doors and being able to visually see where things are at. Makes life easy and can I say… organized! Still wish The Container Store would come this way though!